Eunice Nachtigall, age 82, of Aurora, went to her heavenly home to be in the arms of Jesus on Sunday, June 18, 2017, at the Brookefield Park in St. Paul, Nebraska. A Memorial Service will be held 10:30 A.M. Friday, June 23rd at the Pleasant View Bible Church in Aurora. Pastor Bob Gannon will officiate. Family burial will take place prior to the service at the Aurora Cemetery. Visitation will be from 5 - 8 P.M. Thursday at Higby-McQuiston Mortuary. Memorials may be made to Missions in the Amazon, Haiti Missions, and Pleasant View Bible Church. Condolences may be e-mailed to the family through the mortuary website at www.higbymortuary.com. Eunice Mae Nachtigall, the daughter of Albert F. and Anna (Penner) Bartel, was born in Hillsboro, Kansas on October 23, 1934 and passed away in St. Paul, Nebraska on June 18, 2017, at the age of 82. Eunice attended grades 1-8 in a one room country school house and rode to school 1 ½ miles with her brother, Vernon, on their pony. She lived in Hillsboro with her sister, Ruth, while attending Hillsboro High School graduating in 1952. Eunice then attended Tabor College for a two year secretarial degree. Eunice and Harold Nachtigall met while attending Tabor College and were united in marriage on August 19, 1955 at the Hillsboro M.B. Church. From 1956 to 1960 Eunice performed secretarial work at the Menninger Foundation in Topeka. While living in Topeka, Lanice Kay and Lora Lyn were born into the Nachtigall family (a real blessing). From 1966 to 1974, the family lived in Hillsboro, Kansas where Harold was a math professor at Tabor College and Eunice was the secretary at the Hillsboro M.B. Church. They enjoyed Tabor activities and many gatherings with extended family. In 1974, the family moved to the family farm in Nebraska. They celebrated their 50th wedding anniversary in 2005 and their 60th in 2015. Due to Eunice’s failing health, she moved to a skilled nursing facility in August 2016. Eunice accepted Christ as her personal savior at an early age and on May 22, 1949 she was baptized and joined the Hillsboro Mennonite Brethren Church. She became a charter member of Fairlawn Mennonite Brethren Church in Topeka, Kansas on September 23, 1958. She rejoined the Hillsboro M.B. Church on October 16, 1966. Eunice became a member of the Henderson M.B. Church on May 20, 1975 and joined Pleasant View Bible Church in Aurora, when they retired in 2000 and moved to Aurora. She remained true to her Christian commitment to the end of her days! She especially enjoyed her daughters and grandchildren’s activities and achievements. They were a real blessing from God. Eunice loved family and friends. She enjoyed taking trips and vacations with her children and grandchildren. Eunice was an excellent cook and seamstress having sewed many dresses for Lanice, Lora and the grandchildren over the years. While on the farm Eunice enjoyed, and was involved in the farm work and especially the blessings of Harvest! (She was always happy and willing to lend a hand.) She spent many years singing in church choirs and teaching Sunday School and Bible School. Church was a very important part of her life. Eunice enjoyed a big garden, fruit trees and loved seeing things grow. On the farm in Nebraska, Eunice sold Avon products to neighbors in the area and was a member of the County Agents Farm Extension. She was preceded in death by her parents; two sisters, Margie (Aaron) Reimer and Ruth Ann Bartel and two brothers, Eldon (Ethel) Bartel and Vernon Bartel. 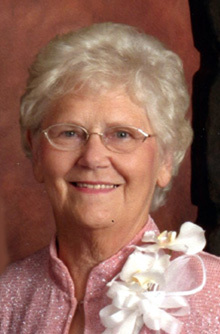 Those left to cherish her memory are her husband of 62 years, Harold of Aurora; two daughters, Lanice (Jeff) Reiswig of Wichita, Kansas and Lora (Danny) Janzen of Aurora; 7 grandchildren, Jason (Chelsea) Reiswig of Olathe, Kansas, Joshua (Christine) Reiswig of Wichita, Kansas; Jeremy Reiswig of Wichita, Kansas; Evan (Emily) Janzen of Aurora; Garrett Janzen of Ames, Iowa; Dylan ( McKenzie) Janzen of Omaha and Bethany Janzen of Aurora and 3 great-grandchildren, Maddox and Brecken Reiswig of Olathe, Kansas and Addison Reiswig of Wichita, Kansas. Eunice is also survived by her brother, Larry (Yolanda) Bartel; sister-in-law, Vida Neufeld Bartel; many nieces and nephews and other relatives and friends.